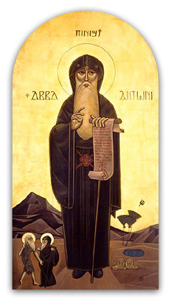 A brief history of Saint Anthony in three accounts, for young families (children 0-8), for practiced families (children 8-14), and experienced families (children 14-adult). By Catherine Fournier. Life of Anthony - By St. Athanasius. Saint Anthony of Egypt Abbot, Patriarch of Monks - from "Lives of Saints", Published by John J. Crawley & Co., Inc.
Hieronymus Bosch: Temptation of St. Anthony, Flight and Failure of St. Anthony, St. Anthony at Meditation, Temptation of St. Anthony. Pieter Bruegel the Elder or his follower: The Temptation of St. Anthony. Paul Cézanne: Temptation of St. Anthony. Giorgione: Madonna and Child with St. Anthony and St. Roch. Francisco de Goya: The Miracle of St. Anthony. Matthias Grünewald: St. Anthony Visiting St. Paul the Hermit in the Desert, The Temptation of St. Anthony. Filippino Lippi: Madonna and Child with St. Anthony and a Monk. Martin Schongauer: Nativity and St. Anthony. The Temptation of St. Anthony. Diego Velázquez: St. Anthony Abbot and St. Paul the Hermit. 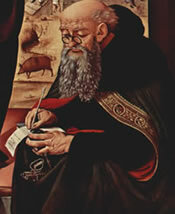 Francisco de Zurbarán: St. Anthony Abbot. Abba Anthony said, "Whoever hammers a lump of iron, first decides what he is going to make of it, a scythe, a sword, or an axe. Even so we ought to make up our minds what kind of virtue we want to forge, or else we labor in vain."